Purchased new in 2014. Used for enthusiastic riding. Seller is the original owner. Seller is 6 feet 2 inches. Inseam 34 inches. Never crashed. Very low miles. The frame set as shown weighs 4 pounds 3 ounces (1.9 kg). The frame serial number reads 3AA5950940082. EPS electronic shifting compatible. Italian thread bottom bracket. 5 mm x 5 mm painted over chip in the finish on lower end of non drive side down tube. 5 mm x 15 mm light abrasion on outside surface of non drive side chain stay near the drop out. Wear around front and rear drop outs. Wear around brake caliper mounts. Abrasions on seat post from seat bag and installation and removal. Ships in custom box. Please see 100 images of the frameset on the Frame and Wheel Flickr Page. Used for racing and training triathlon for two season. Seller is primary owner. Never crashed. Frame set has been ins storage for two years. The owner is 5 feet 11 inches tall with an inseam of 32 inches. The frame set as shown weighs 5 pounds 5 ounces (2.4 kg). 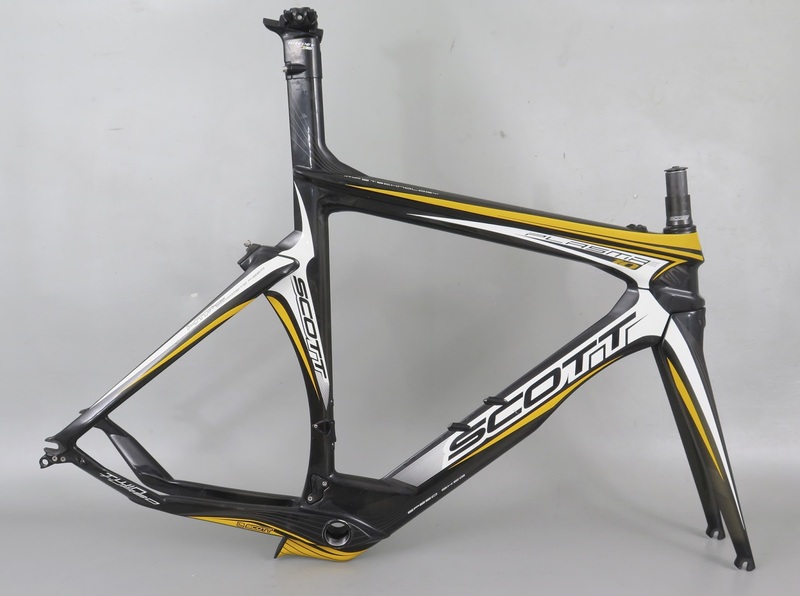 The frame serial number reads STR05DD25209060117. The front fork serial number reads STF03K20008090032. There are 80 images of the frame set on Frame and Wheel’s Flickr page. Please take a look. 20 mm x 60 mm area of blemish and wear in the finish on the top surface of the top tube. 20 mm x 50 mm area of blemish and wear in the finish on the outside surface of the non drive side down tube. 20 mm x 20 mm abrasion on outside surface of drive side chain stay. 1 mm x 12 mm scratch on the drive side surface of the down tube in the “c: in Scott. 10 mm x 10 mm abrasion on outside surface of seat tube near chain stay junction. 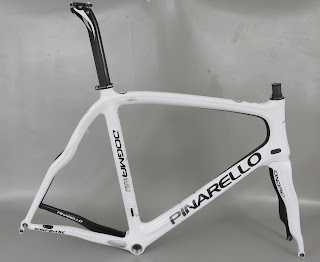 5 mm x 5 mm chip in the finish on the rear upper edge of the left fork. One of the rubber cable guide seals on the top tube is broken off. Wear around the outside edges of the bottom bracket shell. Road wear on the rearward facing surface of the seat tube. Wear around top end of integrated seat post from topper installation. Road wear on the bottom surface of the fork crown. Wear around drop outs. Wear around brake mounts. Light wear through out. 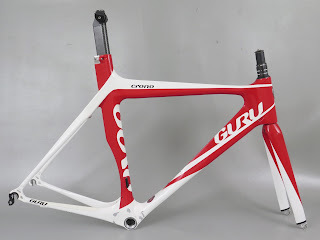 Total weight: 2.4 kg / 5 pounds 5 ounces (frame: 1,740 g fork: 440 g seat clamp: 170 g headset components: 80 g). Purchased new in 2014. 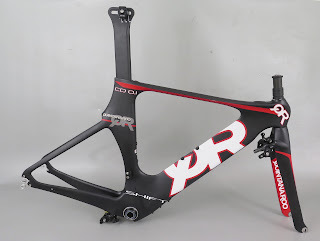 Used for racing triathlon for one season. Seller is original owner. Seller is 5 feet 11 inches. Never crashed. Low miles. 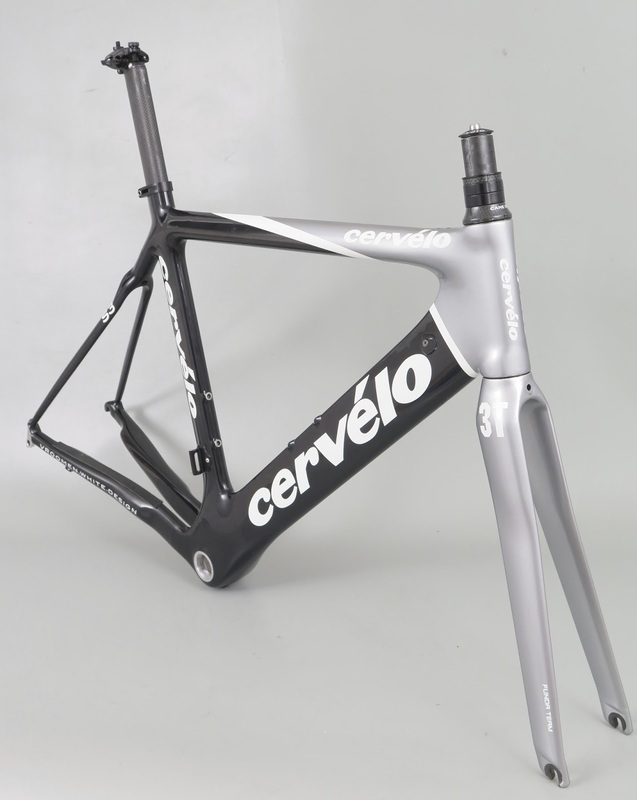 The frame set as shown weighs 6 pounds 3 ounces (2.8 kg). The frame serial number reads F1311M009. 1 mm x 30 mm white abrasion on outside edge of drive side top tube. 0.25 mm white scratch on drive side head tube near “R” in QR. 1 mm x 8 mm abrasion on top edge of down tube. Light 5 mm x 30 mm abrasion on inside surface of chain stay. Wear around drop outs. Brake pads show light wear. Wear on seat post from installation and removal. One of the bolts for the front derailleur hanger is not original. Ships in custom box. Please see 80 images of the frameset on the Frame and Wheel Flickr Page. Purchased new. Used lightly for recreational rides. Low miles. Never raced. Never crashed. In storage for recent seasons. Seller is original owner. Seller is five feet nine inches. 10 mm x 50 mm area of abrasion on inside surface of drive side chain stay from road grit. Bubbling under the finish around non drive side top tube cable stop. Bottom bracket cable guide washer is frozen and prevents cable guide from being removed easily. Some chips in the finish around bottom edges of head tube. Wear around and on the drop outs. Road wear on the underside of fork crown. Please see 80 images of the frameset on the Frame and Wheel Flickr Page. Custom frame set built for owner in 2009. Used for training and triathlons. Never crashed. Owner is five feet nine inches. Owner rides stock road and time trial frame sets in size 54 cm. Six areas of chipping in the finish around the drive side bottom bracket from a dropped chain. Scratches on the drive side chain stay. 4 mm x 60 mm abrasion on the inside surface of the non drive side chain stay from wheel rub. 4 mm x 30 mm abrasion on inside surface of drive side seat stay. Chips in the finish on the lower edge of the drive side head tube. Chips in the finish in some drop outs and the the seat post binder bolts. Road wear on underside of front fork crown. Wear on the rear and front drop outs. Wear around brake mounts. Wear on underside of seat stay. Ships in custom frame set box. Please note required bottom bracket is English thread with a shell length of 70 mm. Please see 80 images of the frameset on the Frame and Wheel Flickr Page.